The state capital is Madison. The largest city is Milwaukee. State nickname is the Badger State. State flower is the Wood Violet. State bird is the Robin. State animal is the White-tailed Deer. 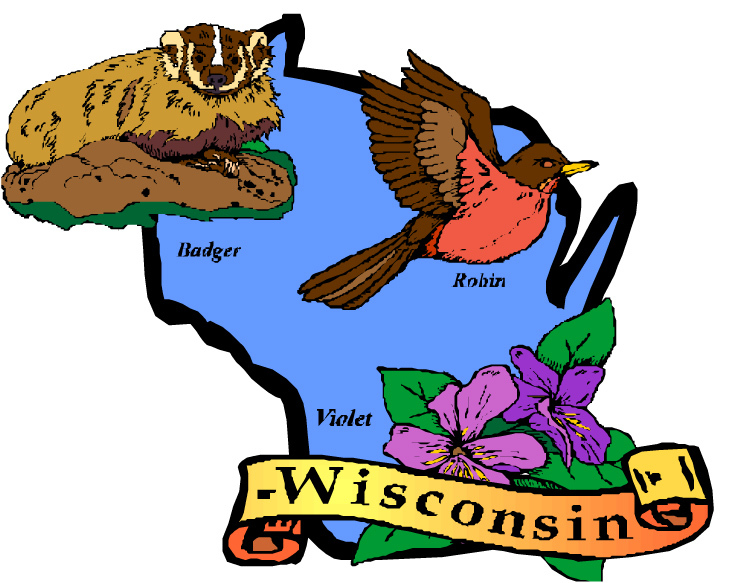 Wisconsin has 7,446 rivers and streams! Allyson K. Abbott (aka Annelise Ryan & Beth Amos): Mack’s Bar Mystery Series – Mackenzie “Mack” Dalton is the owner of a bar who serves up justice. Laura Alden: PTA Mystery Series – Beth Kennedy is the owner of a children’s bookstore. Sandra Balzo: Maggy Thorsen Mystery Series – Maggy is a woman who runs her own coffee shop while solving crimes. Susan Bernhardt: Kay Driscoll Mystery Series – Kay Driscoll is a retired nurse who volunteers at the local free clinic. Ginger Bolton (aka Janet Bolin): Deputy Donut Mystery Series – Emily Westhill runs a donut shop along with her retired chief of police dad and her Tabby cat, “Deputy Donut” >>> in Wisconsin. Christine DeSmet: Fudge Shop Mystery Series – Ava Oosterling is the owner of a copper-kettle fudge shop who sleuths while sharing space in her grandpa’s bait shop. Kathleen Ernst: Chloe Ellefson Mystery Series – Chloe is the curator of a living history museum in Wisconsin during the 1980s. Victoria Houston: Loon Lake Fishing Mystery Series – Lewellyn Ferris is the police chief who enjoys fly fishing while thinking up whodunnit. Mary Grace Murphy: Noshes Up North Mystery Series – Nell Bailey is a retired turned food blogger who lives in Wisconsin. Hannah Reed (aka Deb Baker): Queen Bee Mystery Series – Story Fischer manages her bees while also managing to solve mysteries. Annelise Ryan (aka Allyson K. Abbott & Beth Amos): Mattie Winston Mystery Series – Mattie is an ex-nurse who currently serves as a deputy coroner, which comes in handy in her investigations. Please feel free to comment if you see an author from the Cozy Mystery Site who belongs on this list, or if you have any corrections. My favorite author of Wisconsin mysteries is Kathleen Ernst. Her heroine, Chloe Ellefson, is curator of Old World Wisconsin, a living history museum where author Ernst has worked as curator and interpreter. Her fourth mystery, Heritage of Darkness, is set in Decorah, Iowa, but Chloe retains her roots at Old World Wisconsin. I heartily recommend these books. Ernst also writes for the American Girl series about Caroline Abbott during the War of 1812. Her website is http://www.kathleenernst.com where you can read about her Civil War book as well as the other two series. If you enjoy Annelise Ryan’s Mattie Winston series, you should check out Murder on the Rocks, first in her new series (written under the pseudonym Allyson Abbott. The protagonist, (Ms.) Mack Dalton, has a neurological condition, synesthesia, which a new (and of course handsome) detective soon realizes can be leveraged for crime solving — an intriguing and entertaining premise with interesting characters, the series is set in Milwaukee, WI. Thank you, Susan*, I’ll go add Hannah Reed to the list of mystery authors who have recipes in their books. Ummm… Completely Off-topic, but do you have a page for Card Game / Gambling Mysteries? I looked, but I couldn’t find one, and while I was going through my shelves to find the Hannah Reed mentioned above, I’ve found several Poker / Bridge based mysteries. Susan*, I don’t have a Poker/Bridge or a Card Game/Gambling theme, although those themes sound like a good idea. I’ll try to get a page up for them. I think Games / Gambling about covers all of it. Then, too, I’m sure I’ve come across a Mahjong based mystery, somewhere, recently. Not a card game, but again, is a friendly game really ‘gambling’? Laura Alden’s PTA series takes place in Wisconsin. Also, Kathleen Ernst’s cozy Chloe Ellefson series is set at a living history museum in Wisconsin. I just finished the second book in that series, The Heirloom Murders, and it was really good. Paige Shelton: Dangerous Type Mystery Series set in Star City, Utah. Kathleen, thank you for telling me about this Utah-set series. I have added it to my list. Thanks, again! I read a mystery some time ago and really enjoyed it. It was set in Milwaukee and dealt with the Arabian carpet trade. I learned so much about those wonderful carpets, but to save my life I can’t remember the author/title. Any ideas? Diane, sorry, but that doesn’t ring any bells! Maybe someone else has a suggestion? If not, I’ll add you to a list of questions that I’ll put in a proper “questions” post later.